The unique design of the Colex SharpCUT’s Triple interchangeable Tool Head allows you to quickly and efficiently switch between jobs. 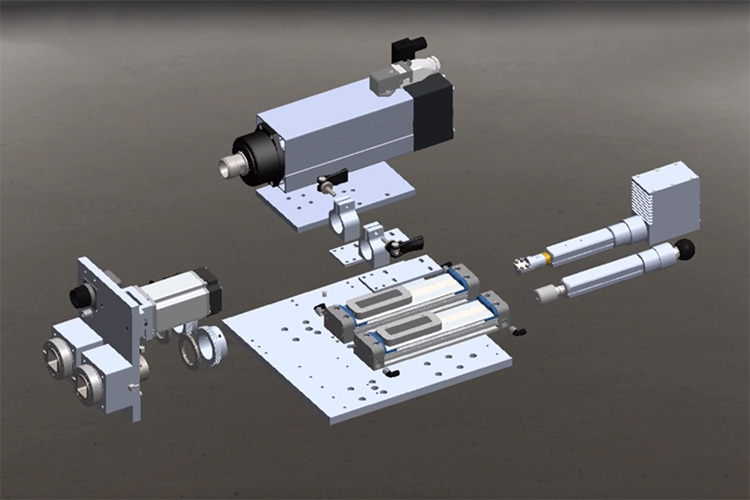 The individual tool modules can be switched in and out of the cutting head in seconds. This allows your operator to transition from Routed work, Knife Cut, and Kiss-Cut workflows rapidly. This minimises the down-time of the machine thus increasing overall productivity. Cut quality and precision were our top priority when we designed the SharpCUT. 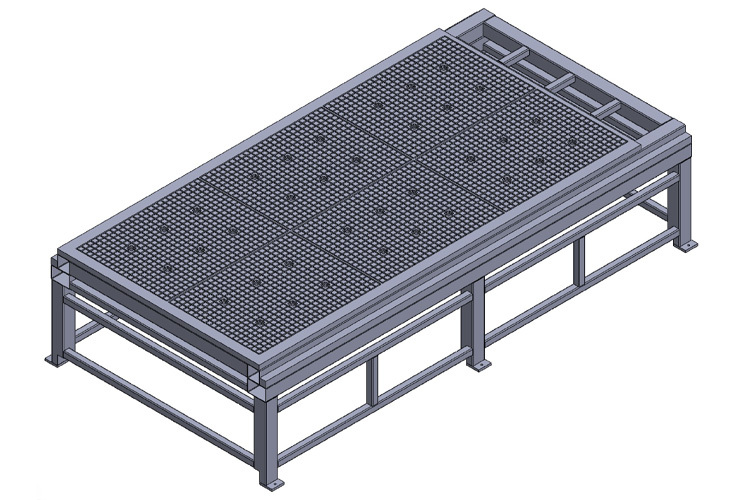 We paid close attention to every detail when designing this machine from the high precision helical rack and pinion to the aerospace grade aluminum gantry. The meticulous design of our gantry system enabled The SharpCUT to get a beautiful polished finish on acrylic, aluminum, and other routed materials. The high precision helical rack and pinion drive not only is very quiet but it also allows the SharpCUT to hold a positioning accuracy of +-0.004 for every 30” of linear travel. 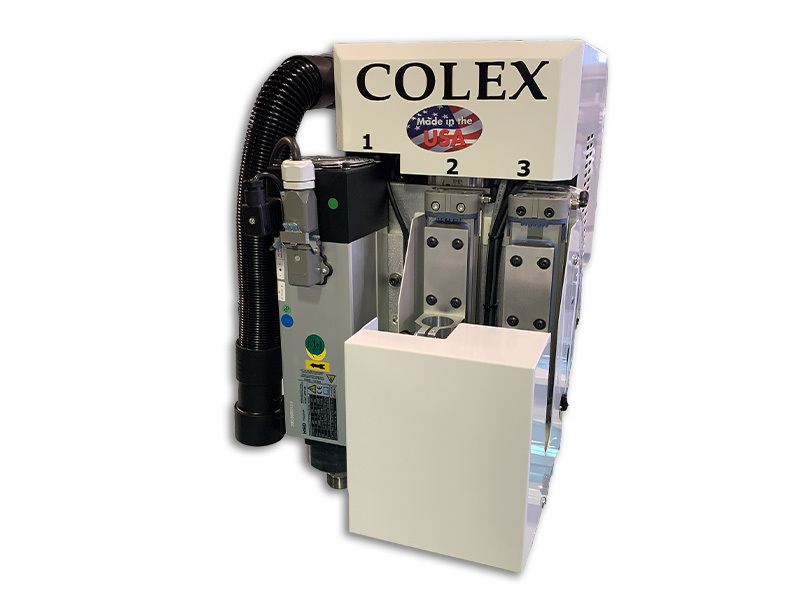 The Colex SharpCUT has a very unique vacuum hold down system, unlike our competitors that have one or two vacuum blowers for the entire table surface. The Sharpcut has one vacuum blower per vacuum zone (On a 5’x10’ model this is a 30”x40” area). There are multiple benefits to this. A less obvious benefit is that there is significant energy savings. If you are not utilizing some of the vacuum zones you can turn them off and save electricity. Being energy efficient is nice and all but what about the vacuum strength? Because of the unique design of our vacuum system it is not required to turn off zones to concentrate holding power. The unused vacuum zones have no effect on the holding power of the vacuum zones you are utilizing. Furthermore, you do not need to cover the entire vacuum bed to concentrate the vacuum area. If there is a need to concentrate the vacuum on a small piece of media you only have to close off the vacuum zone area you are utilizing. As you can see there are many benefits to this design. The Colex SharpCUT’s proprietary Triple Interchangeable Tool Head was designed with ease of use in mind. Station one on the tool head is designed to be compatible with any of our HD Power Modules. In station one switching between the Router, Laser, HD Rotary, and the HD Creasing modules is as easy as loosening and tightening 4 screws. Station two on the tool head is our powered tooling station. This station has a 24V power plug to run our motorized tooling. This tool station is compatible with our Oscillating Knife, Rotary Knife, and all of our fixed tooling. And finally we have station three. In this tool station you can put any of our fixed tooling. In both station two and three the process of changing a tool is as easy as unlocking a cam lever, removing and inserting the new tool, and locking it in. What all of this means is that your operator can switch from routing, to kiss-cutting, then to packaging very quickly and with ease. 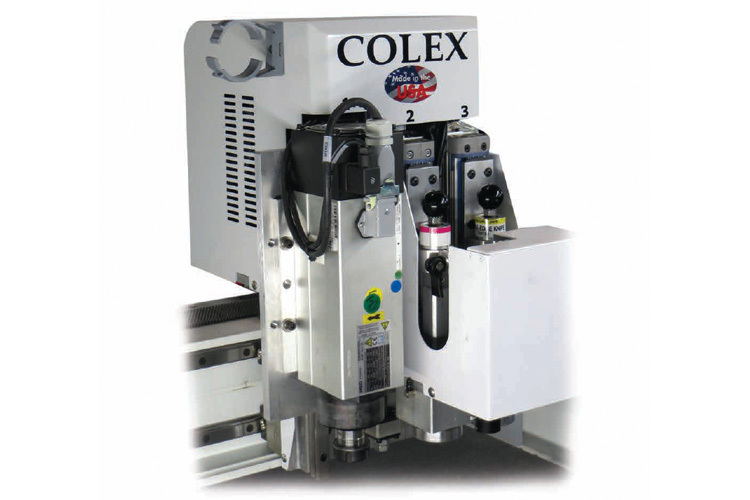 Back in 2007 when we began to design the Colex SharpCUT we saw a large gap between two types of machinery. Most wide format graphics shops at this time needed both a routing table and a flatbed knife cutter to finish their media. A machine that was capable of routing thick rigid boards and capable of switching over to knife/kiss-cutting did not really exist. We saw this as a great opportunity. These two machines are similar but also very different. A routing table typically is very heavy and robust machine. Because of this they move significantly slower than a flatbed knife cutter. A flatbed knife cutter is usually very lightweight allowing it to be quick and nimble. When you attempt to route on this type of machine it isn’t robust enough to get the edge quality that is expected. The challenge that we faced was that we needed a machine that was sturdy and robust enough while still being lightweight and nimble to satisfy both markets. We strongly believe that the machine we developed bridges the gap between these two pieces of equipment. This sample was made using the Overcut Compensation feature available with the Sharpcut. This optimizes the cutting quality of the edges giving you no overcuts and a perfect result. The cutting paths are optimized by the Plot Manager depending on tool, material type and thickness. Specific driver parameters ensure that the objects are cut optimized.